All transactions are safe and secure with a reliable history in online purchasing behind each of our associates. Buy the Rock Paper Scissors Lizard Spock shirt to own Big Bang Theory clothing and merchandise. The rock paper scissors lizard Spock rules are diagrammed on the front of this Big Bang Theory tee using live-action characters. In addition to the normal rock paper scissors rules, there are a few new ones, including rock crushes lizard, lizard poisons Spock, Spock smashes scissors, scissors decapitates lizard, lizard eats paper, paper disproves Spock, and Spock vaporizes rock. The new rules cut down on the number of ties in the original game. 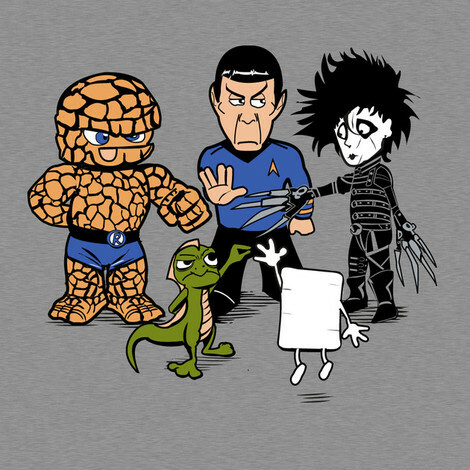 The How to Play Rock Paper Scissors Lizard Spock t-shirt makes it easy to ask your friends if they wanna play. Simply refer to the tee for the rules on how to play. In addition to the Rock Paper Scissors Lizard Spock tee above, browse the Big Bang Theory Clothing Gallery for more apparel like men's and women's clothes, kids shirts or hoodies.